The Home Birth Aotearoa community believe the choice to birth at home is the best for women, babies, whānau and the wider community. We also believe this is an active choice made with careful consideration. This page provides some factual information and testimony to help families make informed choices about how and where they birth. Throughout this section you will find links to more detailed resources on the home birth choice. Sometimes, it’s nice to know the numbers, and statistics are something we are often asked about. Recent figures received from the New Zealand College of Midwives indicate that the rate of Home Births in New Zealand appears to be on the increase. The overall rate of home birth in New Zealand sits somewhere in the vicinity of 3-5% of all recorded births (3.37% the latest figure from the Ministry of Health in 2012, and 4.9% latest figure from Midwifery and Maternity Partners Organisation in 2011). It is apparent that in some areas, where there is good local support from Home Birth associations and midwives, the rate is much higher such a 12.5% rate reported on the West Coast of the South Island in 2011. How statistics are recorded, and where the information comes from is critical. At present in New Zealand, there is no holistic approach that captures planned home birth statistics. The Ministry of Health figures do not distinguish between planned and unplanned home birth. This means the statistics can include high risk and emergency circumstances. The Midwifery and Maternity Partners Organisation reports are based on data by midwives who are members of the New Zealand College of midwives who contribute to the maternity activities and outcomes database. Not all midwives or mothers are included in this database, although it is very comprehensive. Having identified these issues, we are currently working with the relevant parties to try and establish more robust reporting on home birth in Aotearoa. 90% of women who had a home birth were ‘very satisfied’ with individual aspects of care received during their home birth – this includes aspects such as having their choices respected by their LMC and the expertise available immediately after the birth. 4.9 % of babies were born at home. Notes on this table: Among the babies born to the MMPO registered women in 2011, a total of 171 babies were stillborn, with the majority occurring at secondary and tertiary facilities. When a baby has died during pregnancy the midwife refers to an obstetrician to discuss labour induction. Therefore the majority of women who had a fetal death may have been referred to a secondary or tertiary unit to give birth. Similarly not all homebirths are planned and can be the place of birth for precipitate and premature births. Of the 4 neonatal deaths in the home birth group 2 were at a very premature gestation. 28.2 % of women used water immersion for pain management during labour and 7.1 % of babies were born in water. There are physical, emotional, political and personal benefits to birthing your baby at home. The statistics indicate that home birth is a safe and positive choice for low risk pregnancies. This Cochrane review found that planned hospital birth is not any safer than planned home birth assisted by an experienced midwife with collaborative medical back up, but may lead to more interventions and more complications. We believe that the empowerment of women to birth their babies in the way that they choose to do so, in the comfort and safety of their own home is so significant to be immeasurable. Home birth offers the best environment to an unmedicated birth with significantly less likelihood of unnecessary interventions. The benefits are felt by the whole whanau, partners and extended families are able to support fully and children can be as involved as is appropriate for your situation. A higher chance of a natural vaginal birth which has flow on benefits for breathing and immunity for baby. The baby is born with the mother’s antibodies, passed through the placenta. These include immunity to the family’s household germs. Lower chance of infection at home than in hospital environment for both mum and baby. Because mothers and babies are never separated, the baby’s immature immune system is able to function optimally. Hospitals have unfamiliar bugs and microbes and a mother isn’t able to offer herself or her baby the same degree of immunity as she can from home. Bonding with mum AND dad. This bond is not broken for institutional routines and procedures and partners have autonomy to connect in, practice skin to skin and be fully included in the process. Easier establishment of breastfeeding and higher chance of breastfeeding success. Continuous and unbroken connection promotes successful breastfeeding, further supporting robust immunity. Committed, individualised and responsive midwifery care tailored according to your needs and requests. Homebirth midwives provide continuity of care and comprehensive care which differ vastly from the shift work nature of a hospital. Control and autonomy over your decisions, mind and body. Your home, your choice. Having a close and respectful relationship with your midwife and being informed and clear about your birth intentions within your own home, give you the best chance of retaining control and autonomy over your body, birth and baby. Increased chance of natural, active labour without unnecessary interventions. Psychologically in your home you are able to relax more deeply, and move more freely. Outside of the hospital, your labour and birth is happening on your time only, away from rigid routines, standard expected stage timeframes and hospital staff shifts which can all contribute to an unnecessary sense of urgency. Emotional and physical comfort after birth. After you’ve given birth you can snuggle up into your own bed, eat your own food, enjoy your home surroundings. There is no pressure to engage in further checks, move to another room or consider the next process of packing up to go another facility or home. Physiological third stage (natural birthing of placenta). Ensuring that your baby receives all the benefits that appropriate cord clamping offers as well as the reaping the rewards of labour – an oxytocin hit for mum! Experiencing a natural third stage has significant health benefits for both mum and baby. Have who you want, when you want, around you. Birthing at home means self selected support people, as many or as few as you desire. There is the ability for siblings to be present for as much or as little of the process as appropriate. You can decide when to have visitors and make your birth announcement. The Maternity system in New Zealand is based on the concept of having a Lead Maternity Carer (LMC) who coordinates your maternity care in a partnership with you. You are required to choose an LMC to be responsible for your care. Lead Maternity Carers can be midwives, GPs with a diploma in obstetrics, or obstetricians. LMCs are contracted through the Ministry of Health to provide a complete maternity service to you. A primary facility is one that does not have inpatient secondary maternity services, or 24-hour on-site availability of specialist obstetricians, paediatricians and anaesthetists. Here you will still have your LMC present and involved in your birth, supported by other onsite midwives. This is your home away from home option, and includes birthing units. A tertiary facility is one that provides a multidisciplinary specialist team for women and babies with complex or rare maternity needs; for example, babies with major fetal disorders requiring prenatal diagnostic and fetal therapy services, or women with obstetric histories that significantly increase the risks during pregnancy, labour and delivery. This includes neonatal intensive care units. There are six tertiary maternity facilities throughout New Zealand, two based in Auckland and one each in Hamilton, Wellington, Christchurch and Dunedin. The Ministry of Health website provides an overview of the different facilities across Aotearoa here. The vast majority of whanau choose a midwife as their LMC. LMC Midwives work independently or within small groups or practices, and have arrangements for back up care with other LMCs. Midwives also work collaboratively with other health professionals to ensure your needs are met. This may be obstetricians, physiotherapists, chiropractors, acupuncturists, naturopaths, nutritionists, sonographers and many more. The LMC system is ideally suited to home birth. The ability to select your midwife means you have agency from the beginning to plan your birth how you want it to be. Our Midwife database lists midwives who have specifically registered with us as home birth midwives. Many midwives have student midwives of different stages work with them on placement to gain valuable work experience. It may be worthwhile considering your level of comfort with this and speaking to your midwife about it. With the opportunity to select your own midwife, you are entitled to interview and make a selection of someone who you believe will support your birth choices and who is appropriately experienced. For tips on selecting and interviewing a midwife please visit this page on interviewing a midwife. You can change your LMC if you need to. If you are uncomfortable or dissatisfied with the care you have received, the first step is to speak to your midwife if at all possible. You can then decide to change if you want to. NZCOM have Midwifery Advisors available during office hours if you need further advice or support, contact them on 03 377 2732. The cascade of intervention refers to the likelihood of one medical intervention leading to another, to another and so on. Many women are unaware of the increased chances of further interventions when accepting initial intervention for convenience, or simply because they are available! By interventions we are referring to many common and routine medical pregnancy and birth interventions, beginning with testing, working up to induction, fetal monitoring, pain medications and epidurals, assisted births (such as forceps and ventouse and episiotomy) to Caesarean Section operations. Many antenatal tests have high rates of false positives which can lead to additional testing and monitoring and often recommended induction. For this reason it is suggested that antenatal tests and interventions are carefully researched, considered and justified in your individual circumstance. This study confirms that One-to-One midwifery practice can provide a high degree of continuity of carer, and is associated with a reduction in the rate of a number of interventions, without compromising safety of care. It should be extended locally and replicated in other services under continuing evaluation. 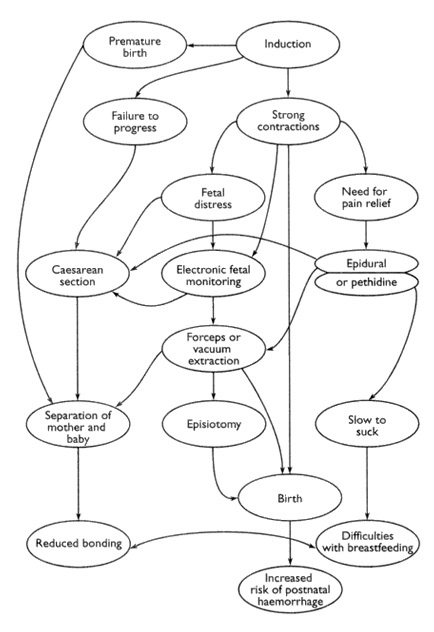 The below flow diagram illustrates some of the potential impacts of unnecessary intervention. It is a fundamental human right to determine where you give birth. The location, type of care and circumstances of birth is not just an individual physiological issue, it is part of a wider political context of feminism and human rights. Birth culture over the course of the twentieth century has become shrouded in medicalisation. This removes agency of women and places their rights and choices into the hands of institutions which perpetuate violence against women. A culture of fear and risk aversion as well as litigious hospital environments mean a woman’s right to choice have been reduced to what she is ‘allowed and not allowed’. The physical and psychological harm to women during birth is always secondary to perceived risk to the foetus. Historical family and cultural birthing practices have taken a back seat in favour of a technocratic and authoritative model. At the same time, advances in knowledge and life saving interventions are available only within predominantly western contexts, whereas women in the third world continue to die of treatable illness and disease in pregnancy and childbirth. The political and social context of childbirth, obstetrics and midwifery and the challenges facing childbearing women offers an evaluation of practices and beliefs. Home birth delivers autonomy, rights and responsibility for birth back to women and their families. The home birth movement in Aotearoa led to changes in our maternity care system to the model we have today. Despite this change, our movement is still highly relevant and has an important role to play in maternity policy, advocacy, provision of resources and wider education about home birth. Please see our resource section for recommended reading on the politics of birth.